-- Create the server audit specification. -- Enable the server audit specification. -- Move it to the target database. -- Create and enable the database audit specification. Click the "Search" button and review what changes were made to view permissions. When a database (DB) owner grants SELECT object permissions to a view that includes a selection of securable data taken from specific tables, the grantee becomes able to read the information. Therefore, it’s essential to ensure that each database user is granted object permissions, such as SQL Server view permissions, properly — via role membership and with all necessary approvals. Otherwise, users can read more data than they should be able to, which can threaten data security and result in the exposure of sensitive data. 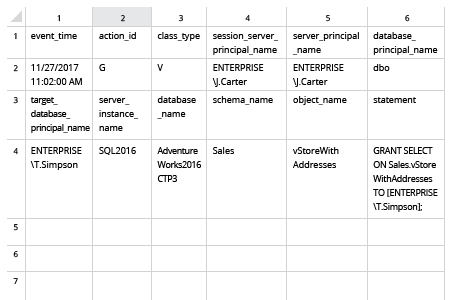 There’s a simple and reliable way to stay abreast of all changes to SQL Server permissions and database roles and thereby protect your critical data. 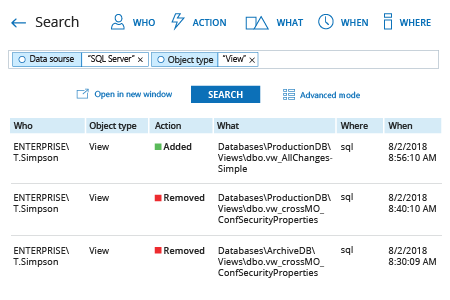 Netwrix Auditor for SQL Server delivers 360-degree visibility into what’s going on across your SQL Server, including not just changes to access rights, but also all SQL logins and changes to underlying tables, stored procedures and more. Forget about manually building Transact-SQL scripts to generate reports. The easy-to-read reports provided by Netwrix Auditor show each action and who made it and when, so you can quickly identify improper changes and unauthorized logins and investigate them quickly to safeguard your sensitive data.